I am still in Mazar-e-Sharif even though my visa already expired – on July 15. I sent my application to extend my stay for another month, but the process is very complicated and slow. I had to send my application with a copy of my school certificate; as well as a letter from the Embassy where my Afghan visa was issued. And I had to have invitation letters from the Czech NGO (Non Government Organization) People in Need from Prague as well as a formal request for my stay from my hosts in Afghanistan. All these documents were sent to the Ministry of Economy (PIN is registered there) a week before my visa expired. From there the application will be sent to Ministry of Foreign Affairs. A couple weeks ago, visas could still be issued in Kabul as well as in Mazar-e-Sharif and others large cities. Not any more. All foreigners must go to Kabul. The authorities make it very difficult for foreigners. They seem to want us out of the country. And I have no news from the Afghan authorities yet about my application, so I really hope I will get some news soon. Did I complain about weather in the last letter? I did, didn’t I? I guess it was too early; it was only 42 Celsius, nice and cool weather compare with what it is NOW! Believe it or not: it has been 48°C the last three days, yes, forty eight in shadow. 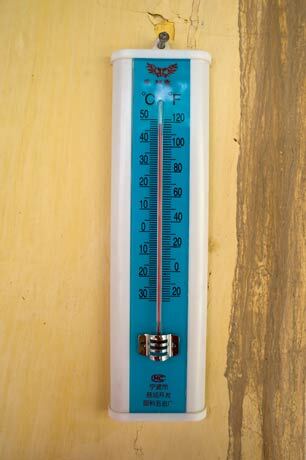 Our thermometer only registers until 50 Celsius…..it’s crazy. It’s not good to stay in the compound all the time, because you’ll go a bit nutty if you do. So I was lucky to have the opportunity to go on another field trip; even it was just for one day in the Toqay district, one and half hours from Kabul. Uzbek people live there, and women (most of them) do not mind being photographed. 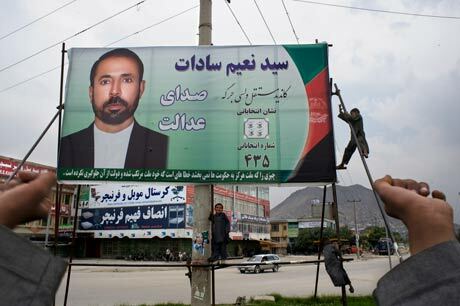 The Afghan parliamentary election is scheduled to take place on September 18th (postponed from May 22nd). The campaign which kicked off at the end of June will be a major test of Afghanistan’s political progress and security. Depending on how it’s run, the Sept. 18th balloting could be a major advance toward stability; or, if there is fraud on the scale of last year’s presidential elections, a big step backward. In Balkh province my “mission” for the Czech NGO People is finished. In Kabul, I will document a teacher’s training and hope also to document the parliamentary election campaign. 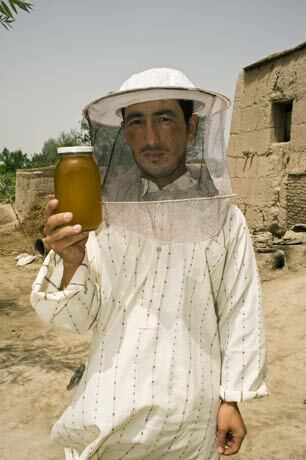 My last shoot was in the Toqay district, the ISNA (Income Stability in Afghanistan) beneficiaries: a beekeeper, agriculture nursery and wool processing. So goodbye Marghzar, goodbye Zare and Kishindeh. Goodbye Mazar-e-Sharif, goodbye Balkh. I am off to Kabul on Saturday. PS. And I have almost forgot, my visa application is already at the Ministry of Foreign Affairs and I will have an answer about my status in couple weeks.